Autumn is our second spring where every leaf becomes a flower. The Divas are “glaming” it up for fall. Pumpkins don’t need to be the traditional orange anymore. The Divas have our own Fall Fabulous ideas! 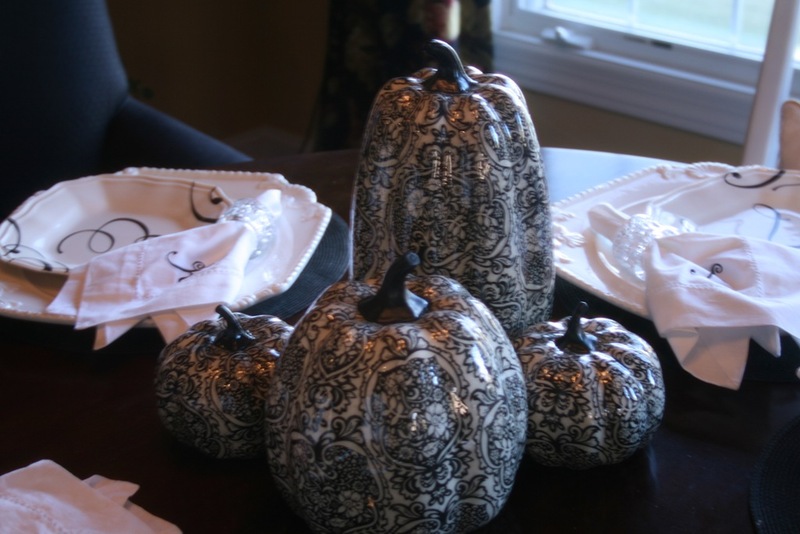 We found these wonderful elegant black and cream Damask pattern pumpkins at Hobby Lobby for $11.99 to $24.99. These beauties will take you right through Thanksgiving. We love them! Why not solid black pumpkins? Every girl has that special little black dress why not a little black pumpkin? CoCo Chanel would be proud to have this chic pumpkin dripping with pearls in her home. 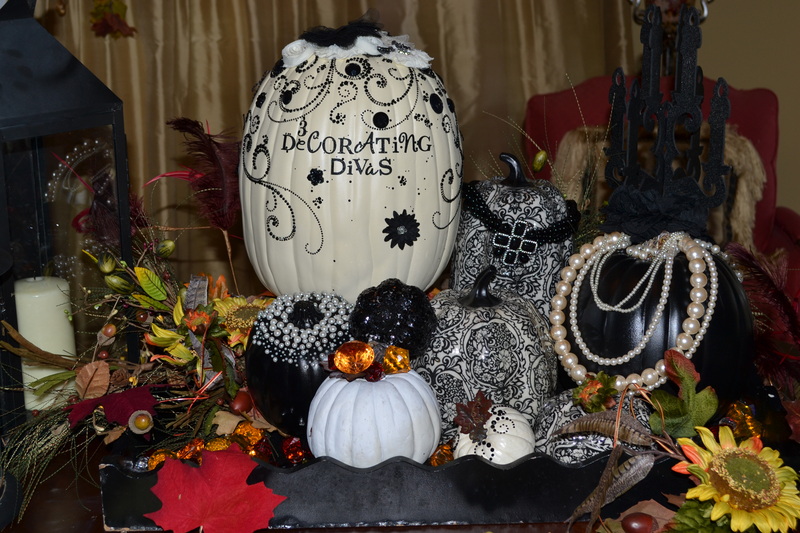 The Divas turned a plain cream pumpkin into modern fairy tale using black crystal filigree. We embellished our pumpkins with luscious jewelry from our jewelry boxes. Pearls, rhinestones, mixed match earrings and even grandmother’s broach. Glamour, tradition and “bling” works every time. Since we broke the rules with the pumpkins, let’s create a fall burst of color with the greenery. Use lots of burnt umber, golden yellow, dark greens and fabulous crimson. We added sparkle and glitz with Harvest Acrylic Gems. They come in different sizes and colors like red, gold and clear. You can find them for a steal at Michaels for only $3.99! We placed all these wonderful treasures in a huge black tray and placed it on a gorgeous table top. Let’s not forget about the wonderful smells of fall. Candles! We found this fabulous flameless wax candle bowl by Habersham at Venetia’s Home Accents for $26.99 in Orland Park. We purchased one last year and the wonderful aroma is still filling our room. A must for Fall Fabulous! You can find more information regarding this fabulous find on the 3 Decorating Diva’s Facebook page. What about creating a Witches Haven? Our witch is a real Diva she is sassy and styling. She travels the world shopping for whatever makes her happy. She fell in love with this perfect chair, which has a spider web back. She created a place for her little glitzy spider friends to hang out and wait till she flies home. 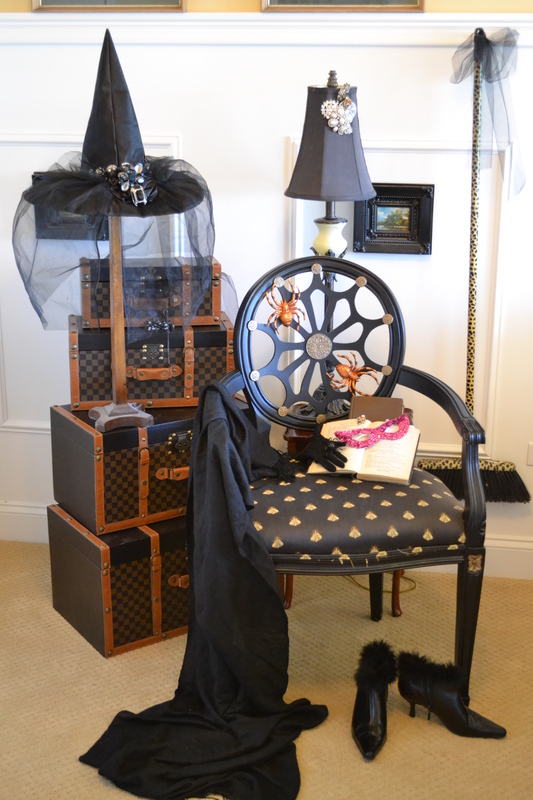 Our sassy witch now has her own place to put her black Diva cape, couture hat, sparkly hot pink glasses (“Think Pink” for Breast Cancer Awareness) and of course, her fabulous leopard print broom (Home Goods $14.99). Next to her chair is a lamp which she embellished the shade with jewelry and trinkets from her many travels. It shines light on her book of spells while relaxing and sipping a cup of warm brew. This Diva loves to decorate any scary space. 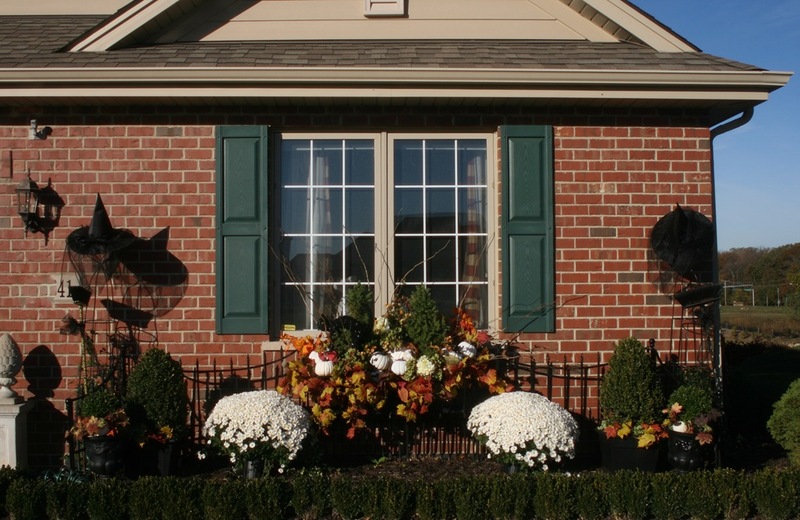 Now it is time to take this Fall Fabulous decorating outside. “Mums the Word”! Fill your front entry way with a burst of color. It’s easy when you use mums. Just remember, to make a show stopper you will need to use at least 6 to 8 plants. Mix with mums with those glorious cabbage plants. Don’t forget to dress your window boxes by filling them with pumpkins, gourds, mums and almost anything you desire. I hope that all the Divas ideas will help you with your FALL FABULOUS DECORATING! This article was in the October issue of the South Frankfort Life, Schoolhouse Life and Butternut Settlement Life by N2 Publishing. 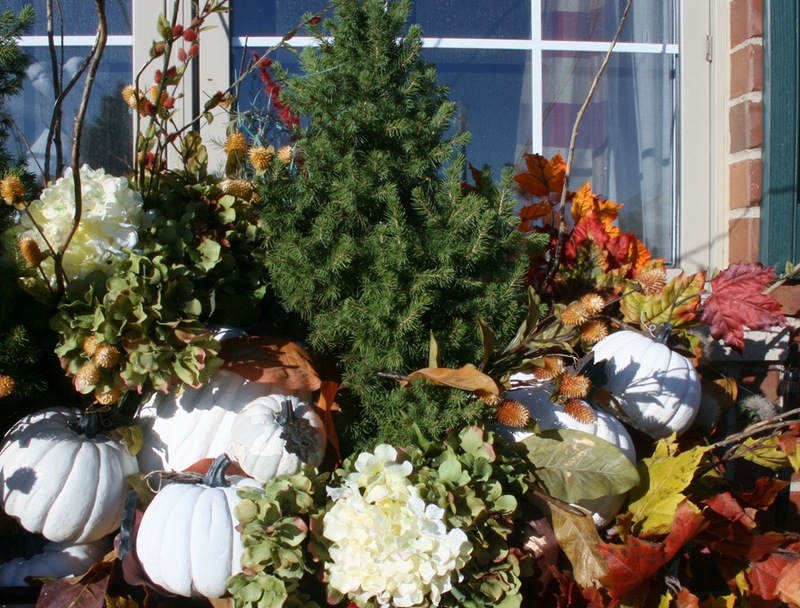 Decorating for the fall can be very fun with some simple basic steps. First, you need to take out your old summer annuals from the window boxes and cutting back any summer foliage on the ground. 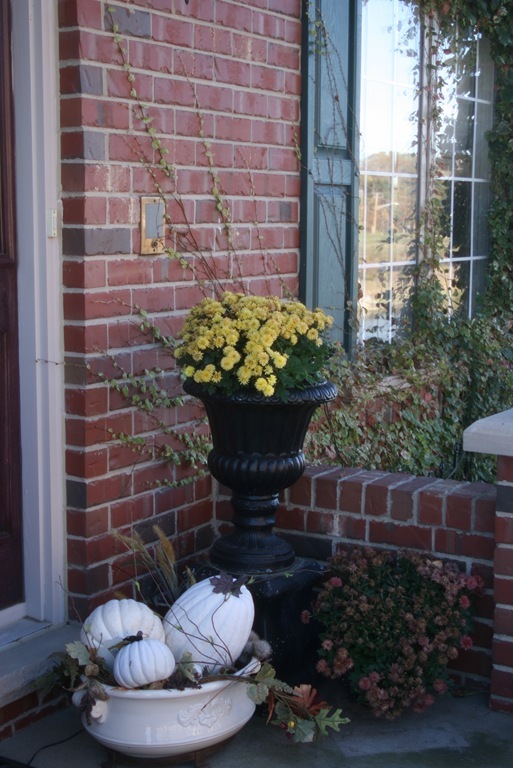 At our local nursery, we purchased beautiful mums in white to coordinate with the white pumpkins. 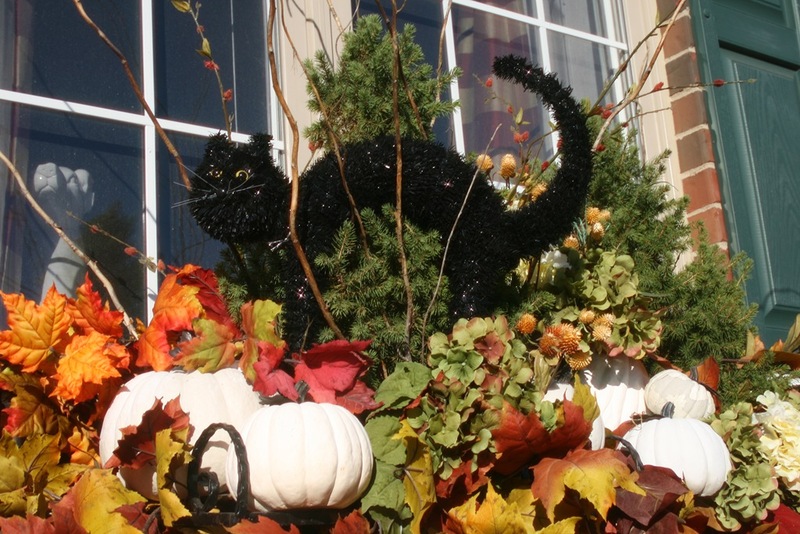 To decorate for Halloween, we added this black cat that we found at Walgreens for $9.99. . 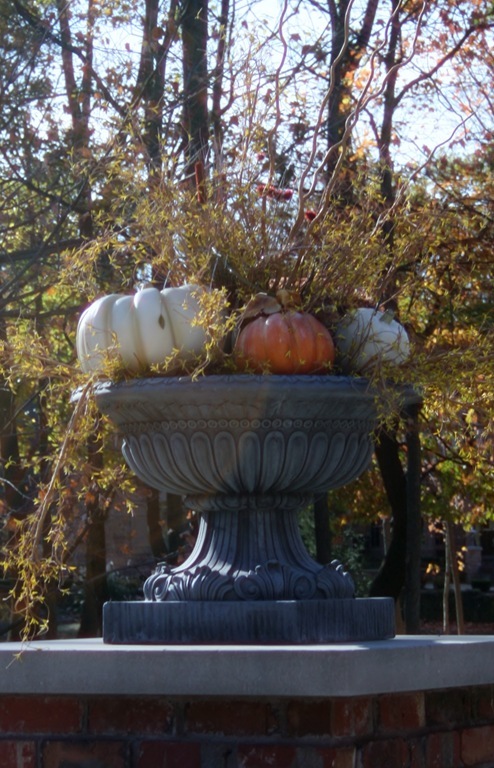 Above are other planters we have decorated. 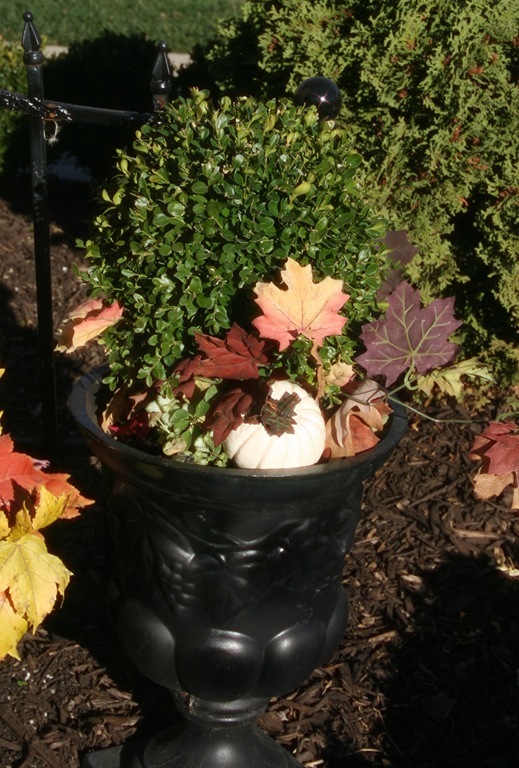 By simply adding fall leaves and white pumpkins, you can make a boring planter come to life! Here, we have decorated a broom with a big bow and black tulle. We added a witches hat with black roses to decorate for Halloween. Don’t forget to decorate the inside of your home with a few simple pumpkins. These beautiful black and white pumpkins were found at Home Goods. Decorating for Thanksgiving is very simple, just add a few more pumpkins. Here we added an orange pumpkin and more foliage. 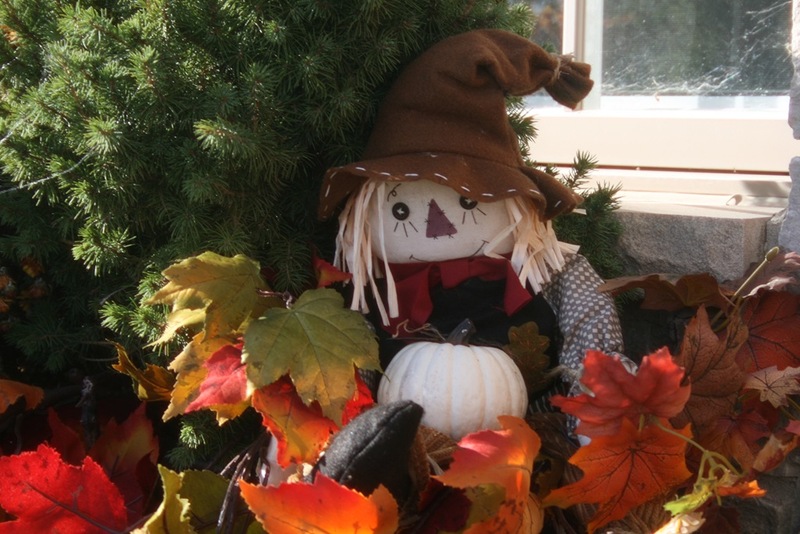 Below we have added a cute scarecrow to our window box. The first step is to remove all dead material from the winter or last summer, this also includes old soil from the prior year. I purchased these window boxes from Alsip Nursery (http://www.alsipnursery.com/site/) and spray painted them black. Next, I add fresh soil and mix it with the existing soil, don’t add too much. Remember the plants you will be putting in there will take up plenty of room. The 3 Decorating Divas scour the best nursery’s not only for princing, but care of plants as well and selection. We shop at Sunrise Nursery in Grant Park, IL. If you decided to go there, it is best to get there prior to Mother’s Day. The web site is http://www.woldhuisfarms.com/. We purchase hanging Supertunias for $13 and break them up in sections. The Supertunias grow in all directions and hang down, plus they don’t need to be deadheaded either. We also add green foliage, either a vinca vine or potatoe plant to help with fullness. Next, add a pop of color. This year I selected a baby blue for our expecting son in July. We add our sticks for heigth and drama. At first the window box will not appear to be in perfect condition, but that is due to shock and the flowers will start to grow in shortly. Don’t forget to give them a good watering and feed your flowers daily. We use Mircle Gro Liquid Feed every day. Add some decorations!! You could easily put in smaller old white bird cages, which are sold at Michael’s or cute little elves or knomes. Perhaps a birdhouse or small humming bird feeder. Around 4th of July, I like to add American Flags. Have fun and be creative!! I planted early this year on May 5th, which is no problem. However, if you get a freeze, just cover up your potted plants with a sheet, plastic bag or tarp. Have any questions? Leave a comment!!! Need some height in your window box or flower box?? 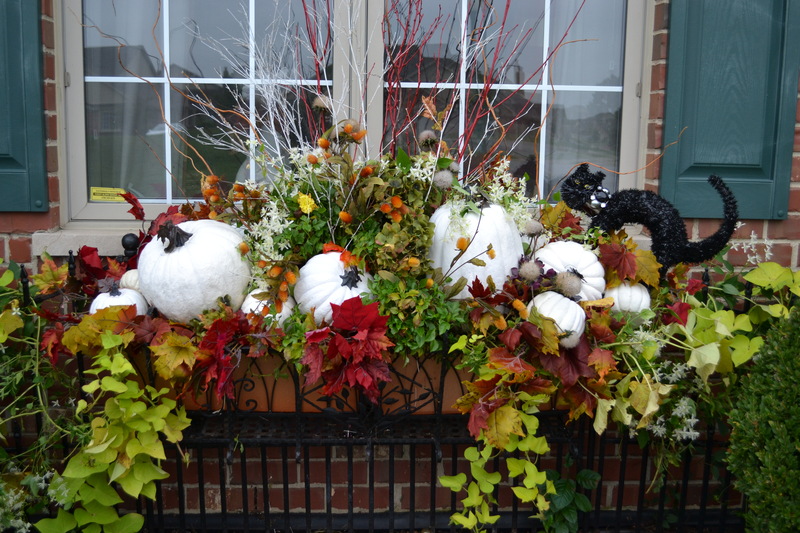 Here is a window box designed by Maureen at 3 Decorating Divas. She incorporated the sticks for height and Wave Petunias with potatoe plants and evergreens. Remember to fertilize using Miracle-Gro Liquid Feed frequently to help your flowers bloom and grow. 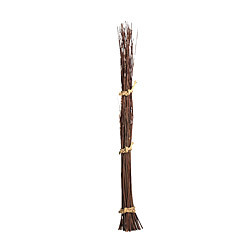 Go to Ikea and purchase a bundle of natural sticks called SMYCKA for $14.99 (see photo and link below) and arrange them to come out of the center and sides of your window or flower box. This looks great and adds element in the winter when decorating for the holidays. Weekly Tip 4/1/10 – It’s time to spring into spring. 4/1/10 – It’s time to spring into spring. Here are a few fresh ideas to freshen up your home. A tip for inside your home, the best way to change a room is PAINT!! Coming up, tips for gardening, painting and re-doing rooms for cheap!